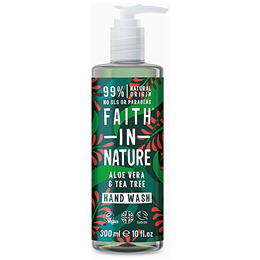 This wonderfully fragrant hand wash contains active aloe vera, uplifting ylang ylang and tea tree oil. Bursting with aromas to energise your day. Made with organic aloe vera which contains many enzymes, amino acids and polysaccarides. 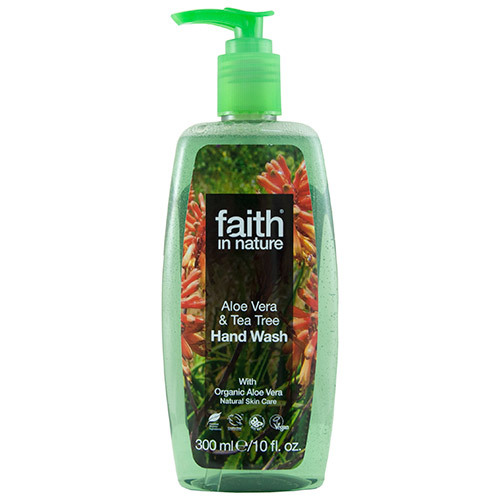 Below are reviews of Faith in Nature Aloe Vera & Tea Tree Hand Wash - 300ml by bodykind customers. If you have tried this product we'd love to hear what you think so please leave a review. I am addicted to the fresh smell of this. No artificial fragrance and SLS free. Leaves my hands soft. Very reasonable price it's a good size bottle. The best hand wash. Great clean, refreshing scent. Does not dry out hands and lasts really well too. Love Faith in Nature products, smell great and are kind to your skin. Love this hand wash by the kitchen sink. You really feel your hands are clean and ready for handling food.